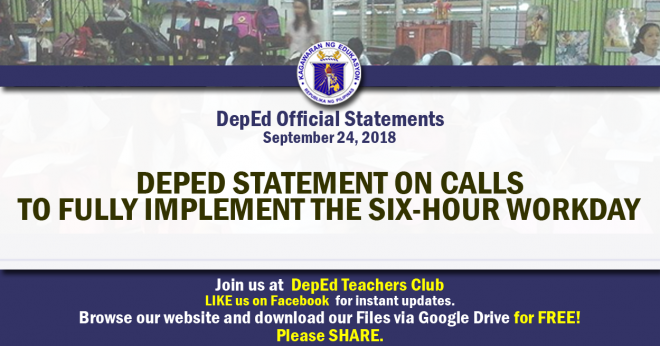 As a response to the concerns pertaining to the working hours of public school teachers, the Department of Education (DepEd) clarified that teachers are not exempted from the eight-hour workday in government, as resolved in the Civil Service Commission (CSC) Resolution No. 080096 issued in 2008. Under the CSC Resolution, teachers are required to render six hours of actual classroom teaching per day within the school premises, while the remaining two hours may be utilized to doing teaching-related tasks outside the school premises. • Teachers should not be required to submit means of verification (MOVs) as proof of services completed during the remaining two hours of work rendered outside the school premises. The said DM will also direct key offices to monitor the strict and uniform execution of this policy.